Baking a fluffy pink cupcake is awesome, but wearing a dress that looks like one? No, thank you! Cousins Willow and Delia can't wait to spend a week vacationing together with their families. 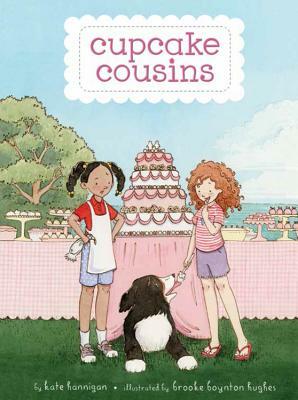 Their aunt is getting married, and Willow and Delia are hoping their tasty baked goods will be enough to get them out of being flower girls in the wedding. But with a mischievous little brother, a bacon-loving dog, and a misbehaving blender in the mix, their treats don't exactly turn out as planned. When a real emergency threatens to ruin the wedding, will their baking skills be enough to save the day? Join Willow and Delia in the kitchen by following their scrumptious recipes for whoopee pies, peach pancakes, and other tasty treats! "[D]ebut novelist Hannigan has assembled all the ingredients for an entertaining and gentle-natured family tale." "Hughes' cheery black-and-white illustrations capture the cousins' exuberance, highlighting both misadventures and sentimental moments. . . . Hannigan's lively tale celebrates family and friendship." Kate Hannigan, a former journalist with the San Francisco Chronicle and the Dallas Morning News, works as an online editor and writer in Chicago, where she lives with her husband, three kids, two frogs, and one noisy dog. An active blogger and dangerous home cook, Kate enjoys carefree Michigan summers, riding bikes, picking blueberries, and chasing fireflies. This is her debut novel. Say hello online at KateHannigan.com. Brooke Boynton Hughes grew up in Loveland, Colorado, where she spent lots of time drawing cats, mermaids, and tree houses. Today, she holds a BFA in Printmaking from Colorado State University, an MFA in Figurative Art from the New York Academy of Art, and she loves baking cupcakes. She currently lives in Colorado. This is her first book. Visit her online at www.brookeboyntonhughes.com!